"We’re going to have to rescue ourselves"
There's a fine line between being gullible and being stubborn. You don't want to automatically embrace every new idea you are exposed to just because it sounds nice, but you also don't want to automatically reject every new idea just because it's different from what you currently believe or is uncomfortable. And that's a hard line to walk. When I hear a new idea, if I just turn around and repeat it because I like it, it's not my idea. I'm just parroting. 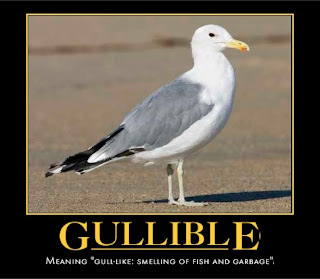 I might be demonstrating gullibility because I haven't really thought it through enough to know whether it makes sense. So I don't usually just repeat ideas. When exposed to new ideas that sound good to me, I take them in, rip them apart, see how they work, put them back together, see if there are any leftover pieces that don't fit anywhere, and then if they pass the test I consider them my own to share or to keep considering. This way I am less likely to be mindlessly parroting other people's ideas. And, I hope, less likely to fall for nonsense. Sometimes the process takes years and sometimes it takes minutes (which can seem almost like mental years). It also means that by the time I've gone through the process I may have completely forgotten where I ran across the original idea so I may not give proper credit. My brain likes to believe good ideas come from inside, without any outside influence. Selfish brain! Even if I don't like an idea it sometimes takes root. It won't go away until I put it through the same paces as the ideas I like. If it passes the test I need to accept it regardless of whether I like it. This helps me avoid being stubborn. I'm not saying this is the right way to consider ideas; just explaining how it works inside my own head.